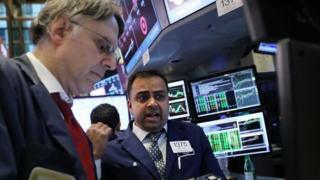 Wall Street edged higher on Tuesday, after the release of a new US budget proposal and in spite of a subdued report on US home sales. Markets are rebounding from last week's dive which came amid pressure on President Trump and investigations into Russian activities in the US election. The Dow Jones climbed 43.08 points or 0.21% to 20,937.91, The S&P 500 rose 4.4 points or 0.18% to 2,398.42. The tech-heavy Nasdaq closed up 5.09 points or .08% at 6,138.71. Stocks in most sectors traded up, with the exception of consumer staples and discretionary goods firms. Financial stocks fared particularly well, with Goldman Sachs up 1.6%. But shares of homebuilders such as Lennar Corp. and the Pulte Group fell more than 1.5% after the US Commerce Department reported that new home sales in the US fell more than 11% in April compared with March. Analysts pinned the drop on a warmer winter, which shifted sales to earlier in the year. Sales increased half a percentage point compared with April 2016. Investors found few surprises in the White House budget proposal, which seeks deep cuts to dozens of programmes providing assistance to the poor. The budget will slash spending on safety-net programmes by more than $1trillion over 10 years. They include Medicaid, the federal health programme for the poor, disability benefits and nutritional assistance. The plan also includes proposals to increase spending on border security - including more than $1.5tn to start building a wall along the border with Mexico. Commentators say Mr Trump will struggle to get the budget passed by Congress, as it faces stiff opposition from Democrats and some Republicans. "In the US all eyes are on Trump's budget proposal. The budget will not pass in its current state but people will keep an eye on any sort of indication of corporate tax reform as well as infrastructure spending," said Nadia Lovell, US equity strategist at JP Morgan Private Bank in New York.